Successfully Added Car DVD /VCD /CD /USB /SD /MMC /WMA /MP4 Player with Bluetooth to your Shopping Cart. 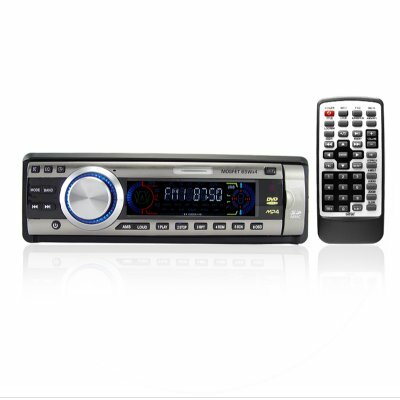 1 DIN Car Multimedia Stereo System with DVD Out. Great for listening to radio and music with ease. Plays CD's and digital music files. Also includes; Radio with RDS. Region Free DVD Player + MP3 discs + DivX. Detachable front panel. DVD OUT feature - use the video out to connect the multimedia player to in car monitor. When using SD/MMC cards or USB keys, for best results, put all your media files in the root folder of the memory card. This lets the multimedia center begin playing your files as soon as you plug them in. This multimedia center does not come with a screen. It connects to any screen or monitor with standard AV-In connection (red, white, yellow). Installs quickly and easily into any standard 1-DIN space. How do I play my own music and video files with this car DVD player? Just load your files on to a USB stick or an SD memory card and plug it into the appropriate slot on the front of the device. The unit will detect and play your files automatically. You can use the remote control to skip through files. Is the face plate removable? No. The face plate flips down to load discs more easily, but it can not be removed. What kind of screen does this DVD player come with? Please note carefully, this DVD player does not come with a screen. It is only a DVD and multimedia player. It can connect to a monitor, which must be purchased separately. This means you can buy a big screen for your car and install in anywhere you want.